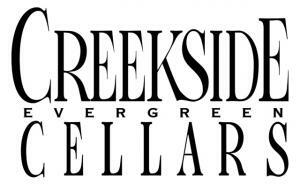 Creekside Cellars is located downtown in the beautiful mountain community of Evergreen. In addition to being a Colorado Winery, we offer a Cafe serving continental cuisine, with an outdoor deck overlooking Bear Creek. We specialize in offering the relationship of good wine served with good food among family and friends. When you enter our Cafe, you immediately are tantalized by the smell of freshly baked Foccacia & Ciabatta- some of our customers tell us they come to Creekside “Just for the smell of it.” Enjoy international award winning white and red wines while dining. A mere 30 minutes west of Denver, Creekside Cellars provides a special place to celebrate a lunch, or linger over one of our antipasta platters accompanied by a glass of wine to enjoy with your special friends and family. Let us help you with your special event such as meetings, rehearsal dinner or other private event. West from Denver, take I-70 to Evergreen Parkway (Hwy 74) south 8 miles to downtown Evergreen. We are located on the Bear Creek side of Hwy 74. East from the mountains take the El Rancho exit. Head south on Evergreen Parkway (Hwy 74) 8 miles to downtown Evergreen.